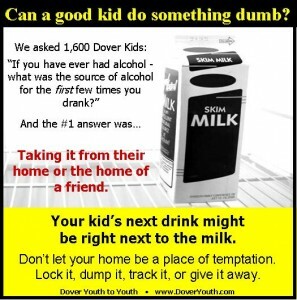 Over fifty youth advocates from Dover Youth to Youth launched a multi-year-long underage drinking prevention campaign designed to educate parents about where young kids most often get their alcohol the first few times they drink. This campaign is based on a Dover survey of 1,600 students. In that survey kids were asked where they got the alcohol for the first few drinking experiences. The number one answer was: from their home or the home of a friend. We believe that alcohol is too easily accessible by youth and decided to raise awareness among parents so they will take steps to prevent their kids from being tempted to try it. Video PSAs were created and placed on broadcast TV, cable TV channels and on our YouTube site. 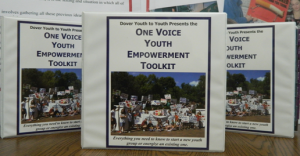 An informational demonstration (activism event) by Dover Youth to Youth students was held downtown (see photos). The Sticker Shock element of the campaign resulted in students going into local supermarkets and placing warning stickers on cases of alcohol. The adhesive sticker said “Can a good kid do something dumb? Your kid’s next drink might be right next to the milk. Don’t let your home be a place of temptation. Lock it, dump it, track it, or give it away”. Before placing the stickers students received permission from all of the stores visited. While applying stickers at Shaw’s supermarket in Dover, employees of New Hampshire Distributors (distributor for Anheuser-Busch products) confronted members of Youth to Youth. Students tried to explain to the distributor what they were doing. The beer company representatives stated that the kids had no right to be placing the stickers on the cases of alcohol and that they were vandalizing their property. They then proceeded to rip some of the stickers off of the cases. Students at the store decided to head over to the Hannaford grocery store where another group of students was placing stickers. The NH Distributor’s employees showed up at that store and began to rip the stickers off the product there as well. To avoid confrontation the students discontinued the project. 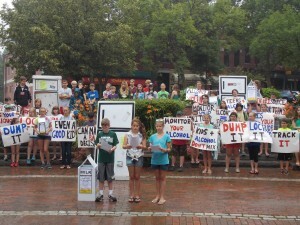 The next day, Wednesday, August 13, the students held a demonstration in downtown Dover to protest the conduct of the company and to reach out to the public about the core issue: how kids are getting alcohol. To get this message out, students set up life-size cardboard refrigerators in three locations downtown. Students also had informational posters that had messages like “Monitor your alcohol” and “What’s in your fridge?” Students also handed out fliers to pedestrians and chanted their message to motorists passing through downtown. The protest, and the press conference conducted with it, was covered by three TV News stations, one radio station, the Associated Press and two newspapers. Following the demonstration and its related media attention, New Hampshire Distributors began adjusting its position. In conversations with various media outlets they conceded that the stores did own the beer and had the right to allow the sticker project to occur. New Hampshire Distributors also requested a meeting with the students of Dover Youth to Youth. The meeting which took place at the McConnell Center was attended by four members of Dover Youth to Youth as well as Christopher Brown, President & Chief Operations Officer, and Tyler Kelly, Vice President of Marketing for New Hampshire Distributors, Inc.
At the meeting there was discussion about what had happened the previous week and how a similar situation can be avoided in the future. Also discussed were ways to further spread the message about the problem of underage drinking. One thing that was agreed upon by both parties was the fact that the stores own the alcohol and have the right to allow students to place the stickers on cases. Kelly and Brown said their employees will not interfere with the project in the future and they agreed to write a letter to Y2Y that can be presented to stores and any employees that may challenge the project in the future.